in some ways, when it comes to personal presentation, i am very stubborn. some lessons i have to be taught over and over again. i wonder if there will ever come a time when i will know it all? something tells me not. and, to tell the truth, i am not sure that i ever want to know it all. deep down, i am a life long learner. i am wearing the alpen top and the tokyo hat (with an added flower pin) by kaliyana. 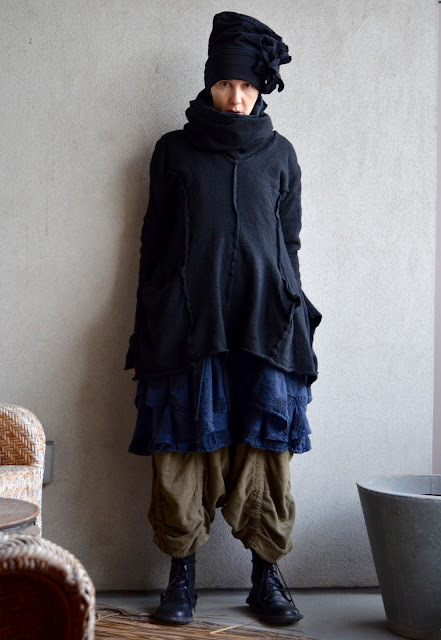 my dress and trousers are by grizas and my pullover is rundholz (black label). i am wearing the rectangle boot (closed collection) by trippen. I do love that blue peeping out between your layers!! When it comes to personal presentation, what, specifically, are the lessons you have to be taught over and over again? brenda: to answer your question, there are some colours that i don't like myself in that i keep returning to over and over again. there are some silhouettes that i don't like myself in that i keep returning to over and over again. sometimes, its the number of layers that i wear (or don't wear). it's a little off from what i have become comfortable with, yet i return to it over and over again. then, there are the shoes. heels aren't really for me, but i remain attracted to them like a magpie to a jewel. the same goes for chunky shoes versus more delicate shoes. i suppose that even though i know better what works for me and what doesn't, i don't want to give up trying, because who knows when a tweak to something that i think doesn't work for me will lead to the next great outfit for me. of course, when that tweak doesn't work, i feel like i should have known better, and that "haven't i learned this already" feeling surfaces. Seeing your most recent posts, I’m again made aware that many of the Kaliyana pieces look exceptional on you – far better than they do on many of the people Kaliyana elects to use as models, for example, and infinitely better than they do on me (neutral fact). I certainly also prefer your outfit styling to Kaliyana styling – hope it’s acceptable to note here that it’s immediately evident when you’re wearing an outfit that you’ve styled yourself, as opposed to one styled by (or borrowing heavily from) Kaliyana staff. If I recall correctly, you did mention in a long-ago post that you were feeling not optimal about things after comparing your own look to those of the Kaliyana window mannequins. I felt sad when I read that. Thanks for sharing insights into a few of your fashion processes. I like hearing about the interesting stuff that goes on in the human mind: the judgments, feelings, and beliefs, and the stories we tell in order to integrate these things into a coherent self-narrative that explains our own behaviors to ourselves. I am with you regarding not giving up on trying, because once people commit to their explanations of themselves, they come to the conclusion that their feelings and beliefs match the reasons they list, and cut off access to continued development through an impenetrable haze of their own theories and expectations. I view my own self-stories as a process whereby I’m continually opening doors to veiled – but not hidden) rooms – giving me direct access to things I couldn’t see before as well as how to make conscious use of them to guide me in new and/or different directions. It’s not easy to know what my non-conscious states are, much less change them, but by deliberately examining (and re-examining) my self-stories, judgments, feelings, and beliefs, they become less deeply embedded into the foundations of my adaptive unconscious. While viewing your blog, I’ve often speculated about what might transpire (wardrobe-wise) were you to set aside many (or all) of your existing fashion rules, stories, feelings, and beliefs. Have you ever engaged in such an experiment, and if so, what were the results? On a superficial note, a) colours in the Bordeaux family really suit you, and b) even though we’re only halfway through the release of Rundholz SS16 – as if the DIP collection isn’t something to be excited about this season! – have you seen any of the AW16/17 collection yet? One of the best collections in the history of Rundholz. The theme is Elizabethan – “The Golden Age”. You and I both will require fainting couches with accompanying loyal attendants this autumn. To die - DIE!! - for. For realz.